The recipe that I use most often from My Grandma’s Vintage Recipes is the one that she labeled “rich corn cake.” It’s a nice and moist corn bread recipe. You only need a few ingredients, and you can whip it up any time you need a hearty side. I like to pair it with any barbecue meats, and it’s also a nice accompaniment for chili. This corn bread produces a moist corn bread every time. The milk, eggs, and melted butter ensure this necessary result. The recipe also calls for 1/4 cup of sugar. I’ve tried making corn bread without sugar, and I’m just not on that team. I try to eat healthy, but corn bread needs some sweetness in it. 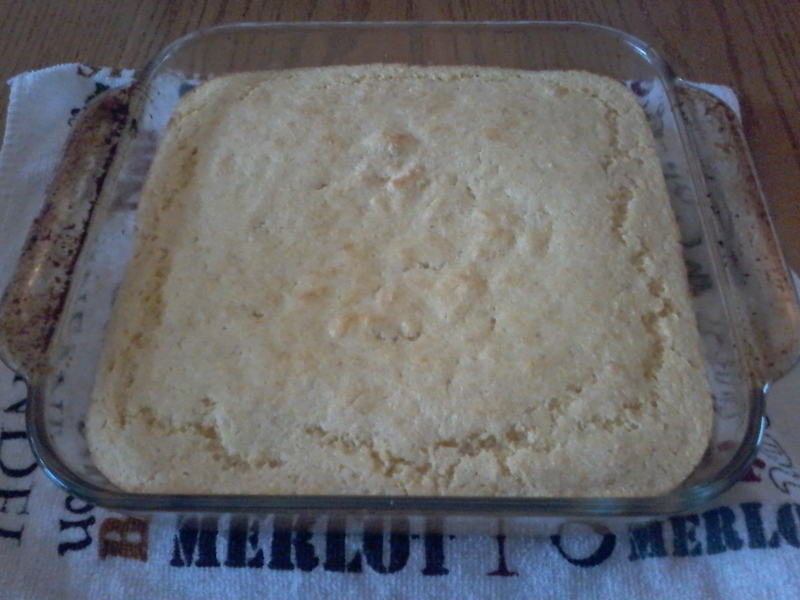 I once made a sugar-free corn bread, and, outside of a survival situation, I did not find it edible. The recipe could have been put to better use making bricks to build a temple to the corn god. The rich corn cake is pleasing fresh out of the oven with butter and honey on it. I use the leftovers to make breakfast. I warm up a chunk and put jam on it. Mix and sift dry ingredients. Add eggs, well beaten. Add milk and melted butter. Beat. Bake in shallow buttered pan in a hot 425 degree F oven for 15 minutes or until done. To study more vintage recipes likes this one, get the whole cookbook My Grandma’s Vintage Recipes: Old Standards for a New Age. Available as ebook or paperback.